The newest book from the South Dakota State Historical Society includes more than 750 photographs of religious buildings that are still standing from every county and nearly every town in the state. 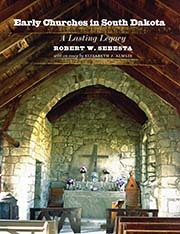 “Early Churches in South Dakota: A Lasting Legacy” by Robert W. Sebesta is the sixth volume in the Historical Preservation Series, and it documents the history of religious structures built before 1930. A testament to the people who built them, churches represent shared religious beliefs, local craftsmanship and community. Members of the congregations often constructed these buildings from readily available materials to fulfill their visions of faith, education and fellowship. Over time, congregations grew, and some hired architects to erect high-style churches on the prairie. From simple wood structures to large stone edifices, each building embodies the identity of its worshippers. Over the course of several years and many trips across South Dakota, Sebesta photographed more than 600 religious buildings built between 1869 and 1930—many still in use, others long neglected. His book details, decade-by-decade, the early efforts to create these places of worship and the modern-day struggles to preserve them. Sebesta was born and grew up in Sioux Falls. He earned a bachelor’s degree from the University of Colorado–Boulder and a Ph.D. from Pennsylvania State University. He taught computer science at the university level for more than 30 years and is the author of several textbooks. Sebesta currently resides in Colorado and travels across his home state whenever possible. “Early Churches in South Dakota” is available for $29.95 plus shipping and tax and may be purchased from most bookstores or ordered directly from the South Dakota Historical Society Press. Visit www.sdhspress.com, email orders@sdhspress.com or call 605-773-6009.